Chain lengths - How will it look? 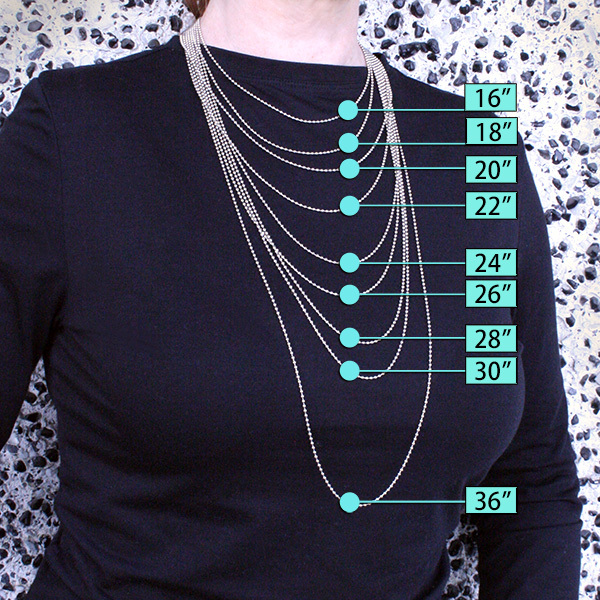 Chain length is an important element of a finished necklace. Don't forget - the size of a person's neck and the general size of the person will influence what length you need for a comfortable fit that hangs down to the right place. This model is 5'5" and an average/slim build. For a more accurate and comfortable fit, have the intended user measure the length they want on themselves with a measuring tape. No tape? No problem. Use a piece of string, mark the length and measure the string with a ruler. Finished chains come complete with a clasp, which is handy. However, being able to put together your own chain really opens up your options for a custom length and look. Check out chain by the inch. Add jump rings and a clasp and you have a custom chain. OR...instead of a jump ring, use a head pin to attach a clasp to chain. It is extremely secure, and you can even add a bead near the clasp for an extra finishing touch. Mel shows you how in this quick video tip. It's easier than you think!